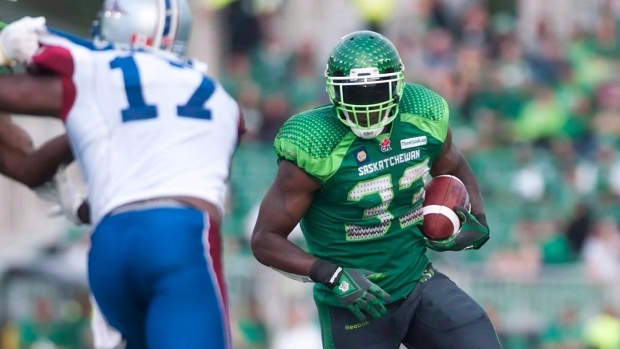 REGINA - The Saskatchewan Roughriders have granted running back Jerome Messam his wish. The Riders signed the Canadian running back to a contract extension Friday. Messam, 29, a Toronto native, was slated to become a free agent Tuesday but had expressed an interest to remain in Saskatchewan. The six-foot-three, 240-pound Messam joined the Riders as a free agent last July, rushing for 382 yards and a TD on 70 carries. He also added eight catches for 134 yards in 14 regular-season games. Messam is entering his sixth CFL season and has rushed for 2,264 career yards and 12 TDs. He was named the CFL's top Canadian in 2011 after running for 1,057 yards and six TDs while with the Edmonton Eskimos.